While the GoPro Hero5 has many of the same specs as the previous generation when it comes to video and photo resolutions, there are some new features in it. 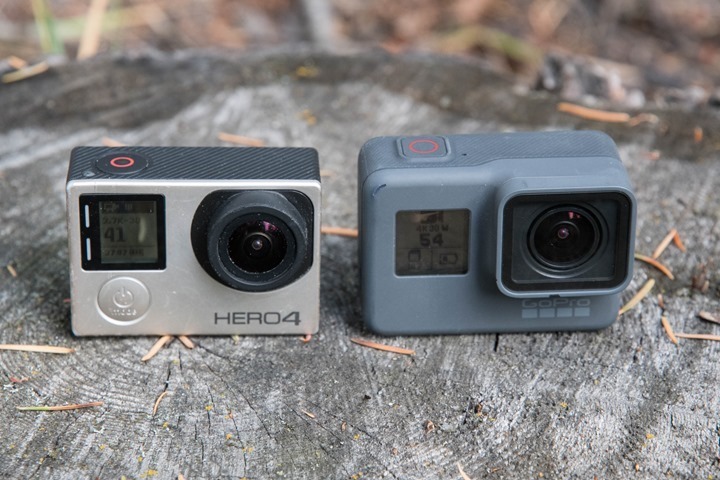 Individually no single feature is a massive leap forward in the action cam industry, but collectively they represent a notable and substantial difference over the Hero4 Black. This section is mostly focused on these new features, while the remaining sections take a deeper dive into the core functions of the camera, as well as touch on these new features in more detail. 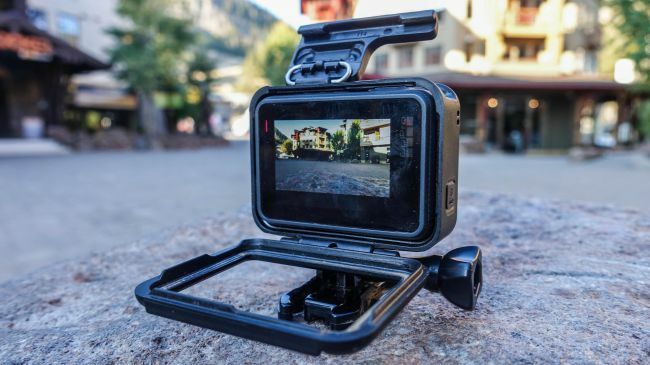 Fully Waterproofed: Probably the most notable item is that the GoPro Hero5 Black is now fully waterproofed without the need for a separate case, just like the GoPro Hero4 Session was. In fact, it has nearly the same rubberish material on the outside. Now this won’t easily pop-off while it’s locked in place, as you have to press a button down to open it (plus slide it). But, the trick will be not losing it after charging your camera or while the charging cable is attached. GoPro does sell the door as an accessory (albeit over priced), and I know I plan to buy an extra door and then seal it up somewhere special in my backpack/suitcase for traveling. Because I guarantee you that I’ll lose it at the most inopportune time on a trip to some beautiful watery location and be unable to take pictures of The Girl underwater in a bikini without the door. The Hero5 takes the touch display found on the Hero4 Silver and advanced it forward. As you might remember, the Hero4 Black actually lacked a display. This was one reason that the Hero4 Silver was actually a more day to day favorite of mine than the Hero4 Black was. However, the touch display acts and feels significantly different here than the Hero4 Silver. The entire menu system has been redone to make it more intuitive to find settings. Along the bottom it shows you the basics for that mode. For example, in the video mode it shows you resolution and frame rate. You can tap on it to change these specs. Only the available frame rates will display for a given resolution. In theory this looks beautiful, but in practice it’s actually more cumbersome than I expected. I think this is because there’s just too many resolutions too closely together for a normal sized finger to hit the right resolution on that small display. All of this is of course waterproof as well. Though, it won’t work underwater. For that you’ll need to use the push-buttons on the top/side of the camera to change modes. Speaking of a wet display, in general I found it doesn’t work well when wet either. Especially if your fingers are wet, it all goes to crap and fails to respond. As I said earlier, in theory the new GoPro Hero5 Black touch display layout looks good, but in practice it needs a bit more refinement. I found that the vast majority of the time while trying to change modes the slight display lag combined with tiny option selectors meant many missed attempts at configuring things. 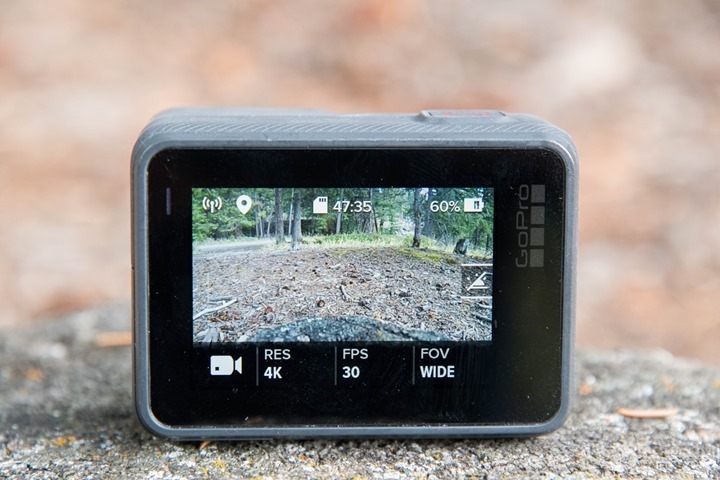 Like the VIRB Ultra 30, GoPro too introduced Voice Control this fall. This means you can simply tell your camera “GoPro, Start Recording”, and it’ll indeed start recording. Same goes for photos, and even changing modes. In fact, you can actually swear an expletive that rhymes with ‘hit’ and it’ll mark a highlight there. It’s cool. You can turn this option on/off, and it’s available in seven languages. Also, if you have the Remo accessory remote, that’ll accept voice commands too in the event the camera is out of range of your voice. But…it’s not perfect. I found that it works most of the time when standing still. But once you start moving I found both it and the Hero5 Session actually perform worse than Garmin does. At about 10MPH (15KPH) I find the ability to give commands pretty much dies no matter which way the camera is facing. Whereas with Garmin it’ll continue working above that speed as long as the camera is facing you. So you’ll see that GoPro has more functionality (commands) than Garmin does. And earlier leaked manuals in August even showed GoPro being able to learn new commands you assign it (that hasn’t happened yet…but that’d be super cool). But in usage, the Garmin actually works better when you start moving, and there’s fewer failed commands. The Hero5 Black contains GPS. But that GPS won’t do anything for you. See, the GPS on the Hero5 Black is merely used to geotag the location of your photos and videos. Essentially it does what Facebook and Instagram do with your phone by saying ‘You were here’ when you took this photo. It is NOT used to record your GPS tracks while you bike/ski/surf/etc… Nor is it used to display your speed on videos. Basically, it’s not used for much of anything except saying “This was taken in NYC”. Electronic Image Stabilization, RAW Photos, Advanced Audio Tracks: I’m bucketing all three of these together, not because they deserve to be together, but because I want to call them out here before I dive into them more deeply down below. These are in many ways some of the biggest differences between the Hero5 Black and Hero5 Session. While the Hero5 Session does have stabilization, it does not have the new RAW photo mode, nor does it have the Advanced Audio Track capability. Speaking of which, let’s talk audio and video modes. Ahh yes, video time. No better place to start diving into features than video modes. In many ways the Hero5 is similar in these modes to the Hero4 Black. After all, it too has 4K @ 30FPS and 720P @ 240FPS, the two ends of the spectrum that people often talk about. The footage looks beautiful in 4K – no doubt. So what’s new and notable here? Well we’ll start with the video stabilization. Technically this is ‘electronic image stabilization’, which works by taking a larger resolution video clip (i.e. 4K) and then smoothing the video by offering a reduced resolution rate while stabilized (up to 2.7K). By doing this it essentially stabilizes by cutting the edges off the corners to make the video appear smooth. It’s the same thing that Garmin does on their VIRB Ultra 30 (but the Garmin is limited to 1440 vs the higher 2.7K), but is different than what Sony does with their new X3000R, where they use optical image stabilization. That’s better because it doesn’t crop any of the image. For cases where you’ve got some light chop in the roadway, or even for hand holding the unit, image stabilization can dramatically improve things. Though, that’s at the sacrifice of resolution. If your final output product’s 1080p, then it’s largely a no-brainer. Do note that it generally works better when you’re shooting something that has a large portion of the image facing one direction constantly. Versus on a helmet mount, it can get a bit wonky as you move the view around a bunch. All of these were simply taken at room temperature; obviously aspects like environmental temperature will impact things considerably, as will other modes and increased frame rates. But those give you some basic bounds to work within. While the Hero5 Black doesn’t offer any more resolution than the Hero4 Black did, it does offer a number of substantial photo-focused features. First, the basics though. To get into the photo mode you’ll go ahead and tap the mode button until you see photos. Or, just tell the GoPro to take a photo using voice commands. Now there are technically different photo modes, including the ability to take a burst photo, a series of photos as a timelapse, or night photos. Note that this photo timelapse is separate from the video timelapse option. This produces a crapton of photo files, whereas the video timelapse produces a single video timelapse file. So you’re trying to choose between the Hero5 Black and the Hero5 Session. Both solid choices, and let me give you some food for thought on deciding between the two (the next section I talk about between the Hero5 Black vs the Garmin VIRB Ultra 30). Do note I’m specifically talking here about the $299USD Hero5 Session, and *NOT* the cheaper $199 Hero Session, which lacks a ton of features compared to the $299 Hero5 Session. The key visible difference being the lack of the numeral ‘5’ in the Hero Session name. That’s the basic differences. Again, both cameras are very good, you won’t go wrong with either. For me, I prefer the Hero5 Black because I like to be able to see and frame up what I’m taking a photo/video of. Whereas the Hero5 Session it’s shoot and pray that you’ve got it lined up. Sure, you can use your phone for certain shots – but most of us won’t do that. 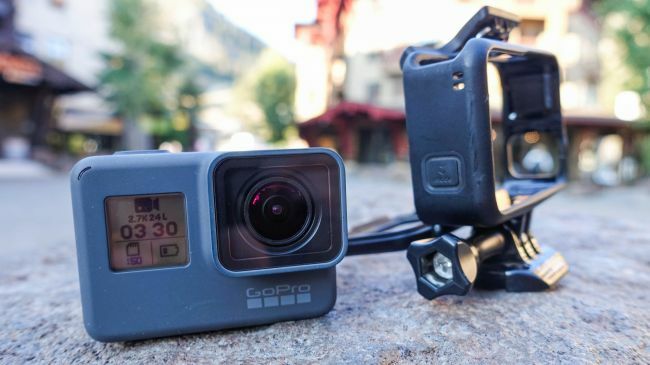 While many lamented that GoPro took two years to get to this post, I agree with GoPro CEO’s statement that this was the GoPro version that they always wanted to make. The GoPro Hero5 is without question the best GoPro out there. Just because GoPro isn’t selling the old cameras anymore doesn’t mean you can’t find them elsewhere. However, there’s not much reason to buy them unless you can get one at a good price and, even then, it might not be worth it because the Hero5 models are so good and there’s plenty of solid competition out there that do more for less. If you’re looking to buy one right now, though, this list breaks down the basic changes from model to model so you can figure out just which one is right for your needs.